The London Mint Office partners with the Imperial War Museums - Samlerhuset Group B.V. The cooperation includes producing ingots commemorating these posters. These posters had a deliberate and open appeal to the young men of United Kingdom to participate in the war. While the war itself is still a hotly debated topic, there is no denying the artwork and effectiveness of the posters. Recruitment posters, writes the Imperial War Museums in an article in Coins & History 1/2018, were deliberately emotive and designed with one intent – to persuade potential conscripts to sign up and serve their king and country. There is little doubt that great thought and equally great handicraft went into the production of the posters. 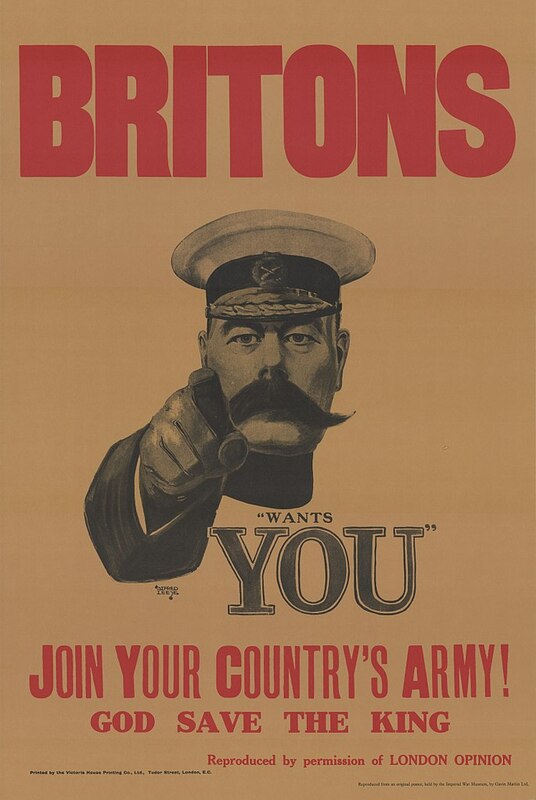 The arguably most famous poster, “Britons “wants you” Join Your Country’s Army!” is, via the equally famous American version of three years later, part of international memory. The model for the officer with the stern look and impressive moustache (if perhaps ridiculed by Stephen Fry’s General Melchett in “Blackadder goes Forth”) was Field Marshal Lord Kitchener. The poster was a game-changer. It was simple, with a clear message and little room for misunderstanding. The Kitchener poster was the only one of 1914, but a plethora of posters came in the following year. The honest tommy on horseback (highly unlikely, but very effective), the Old Lion of England with the young cubs, St. George fighting the dragon and “Women of retain say – Go” all played at the heartstrings and national pride of young men. A more fascinating version was the “Join the Royal Air Force and share their honour and glory”. It looked more like fun than serious. In 1915 that might have been the case. The following year the ace of aces the Red Baron, Freiherr Manfred von Richthofen, terrorized the skies. He shot down approximately 75 British planes. One poster has attracted infamy the article reminds us. 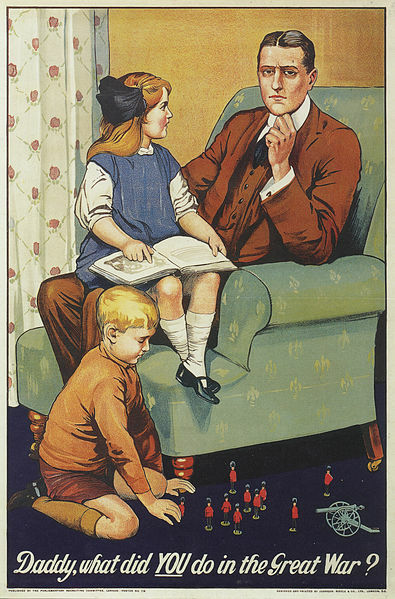 This was the “Daddy, What did you do in the Great War?”, also from 1915. The purposeful use of children for emotional blackmail was effective at first. In the trenches, however, many soldiers hated and ridiculed it. According to the article in Coins & History, the artist disowned the poster shortly after the war. 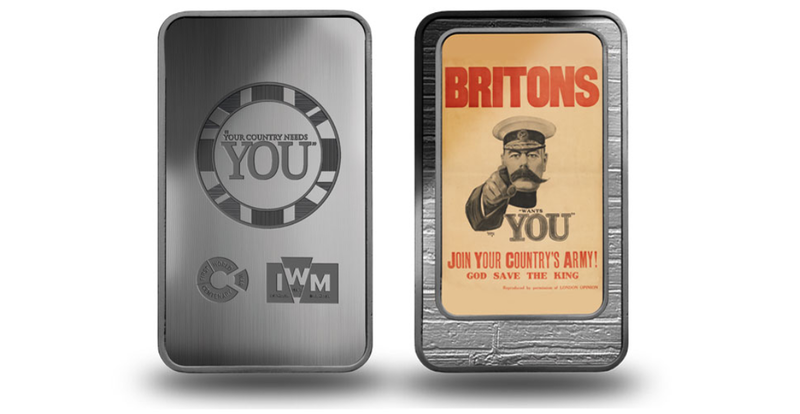 There are all in all eight posters produced in all, including the free (plus postage) Lord Kitchener ingot. Imperial War Museums selected the posters themselves. Thanks to the expertise of Imperial War Museums, the posters themselves are not randomly selected posters. Instead, the series includes both the most known and widely used posters, chosen as a good representation of British propaganda during The Great War.